Long before Windows Vista, there was another Vista in the computer world. 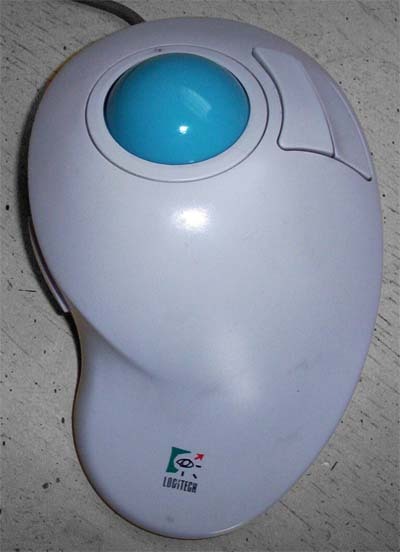 It is the Logitech Trackman Vista trackball. I first laid my fingers on one in 1996. It's thumb click layout for the left mouse button was perfect for my very large hands. Logitech sold them for many years, beginning in 1995. A friend of mine had one, and eventually he told me it had quit working, so he was going to toss it and purchase something else. I managed to get him to give it to me instead, and I took it home and cleaned the rollers thoroughly, and it began working perfectly. That was in early 1997, and I used that trackball from then until I purchased my first brand new computer in 2003. It was pretty worn out by then, so I just used the Dell mouse that came with it at that time. In 2007, I decided to try to locate a replacement for my worn out trackball, and I managed to procure one on eBay for around $20. I shortly purchased another one, which had the newer (current) Logitech logo on it, so I could use it on my laptop. Since then, my used Trackman Vistas have served me well at work. They only require cleaning about once a week, which I admit is worse than modern optical mice, but not too much worse than modern Optical trackballs, which have small bearing-like parts that the ball rides on top of. The environment I work in is extremely dirty, with grease and dirt being a constant threat to the trackballs, but they hold up well. Recently, the Trackman Vista was added as an exhibit at the UK's Centre for Computing History, still in it's original packaging. I have not seen any negative reviews, from some of the earliest (1995) to the review on Centre for Computing History's exhibit, which was taken from an Amazon.com review, stating how the review writer was still using his Trackman he purchased in1996 in 2008. I have used more modern trackballs, including a Microsoft Trackball Explorer (which is currently retailing for upwards of $400 on Amazon.com, yikes), and it's pointer precision wasn't as good as that of Trackman Vista is even today.